Helpouts is meant to fill the gaps in Google’s search engine, which sometimes delivers unsatisfactory results because the answers being sought aren’t available on a website. SAN FRANCISCO — Google has opened a how-to shop that sells expert advice on everything from cosmetics to the cosmos in live video sessions streamed on computers and smartphones. The service, called Helpouts, began taking calls for help Tuesday and offer connections to more than 1,000 merchants, instructors, websites and health care specialists who cleared Google Inc.’s background checks. 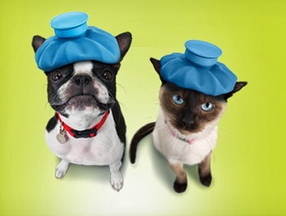 A screen image from the Google Helpouts website, where Banfield Pet Hospital offers free advice on proper nutrition, parasite control, vaccinations and appropriate grooming for pets. It represents Google’s latest attempt to play an instrumental role in helping people manage their lives. Since establishing its search engine as the go-to place to find information online, Google has expanded into giving directions on digital maps and introduced a virtual assistant that is designed to learn about users’ interests so it can provide helpful tips without prompting. Helpouts is meant to fill the gaps in Google’s search engine, which sometimes delivers unsatisfactory results because the answers being sought aren’t available on a website, said Udi Manber, a Google executive overseeing the new service. “Sometimes, you need someone to look over your shoulder. Sometimes you need someone to show you the way,” Manber said. For starters, Helpouts is offering to connect people with experts in eight different categories: art and music; computers and electronics; cooking; education and careers; fashion and beauty; fitness and nutrition; health; and home and garden. The fees will be set by each expert, with 20 percent of the revenue going to Google for most video chats. For now, the Mountain View, Calif., company isn’t collecting a commission for health advice. Experts can charge a flat-fee per session or by the minute. If the advice is unsatisfactory, Google is promising to refund the money. A Helpouts application is being offered for smartphones running on Google’s Android software. The service isn’t yet available for Apple Inc.’s iPhone or other mobile devices running on different software. Besides opening up a source of new revenue for Google, Helpouts could give more people a reason to set up a profile on the company’s social network, Google Plus. That’s because a Google Plus account is required to seek advice on Helpouts. The company says it currently has about 540 million Google Plus users. Helpouts is similar to several other online services that already provide connections to experts in various fields. Pearl.com, a San Francisco startup formerly known as JustAnswer.com, also sells live video sessions on a wide variety of subjects. HealthTap dispenses medical advice and RocketLawyer specializes in legal matters. Google’s new service also may end up competing with the company’s own YouTube video site, which offers a wide array of how-to clips for free. This isn’t the first time that Google has tried to supplement its search engine with the knowledge of human experts. The company also once ran a service that hired researchers to field questions about homework and other subjects. That service, which charged anywhere from $2 to $200 per question, closed down seven years ago.